Floor removal is a big job that requires serious machinery. With the Terminator flooring removal products our clients can tackle even the largest project with ease. Terminators are ideal for tile removal, carpet and more. Innovatech Technological designs and manufactures the world-renowned Terminator tile scraper and floor removal line from their headquarters in Everett, Washington. 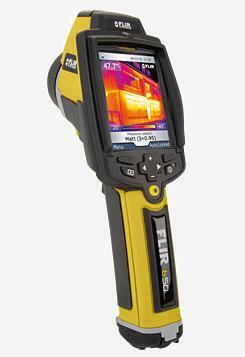 “Thermal imaging cameras” FLIR infrared cameras offer a non-invasive means of monitoring and diagnosing the moisture content within a structure. With a FLIR infrared camera, you can instantly locate moisture wherever it may be, so you can take quick action to eliminate it. You can see moisture without physically disassembling structures or disturbing inhabitants. FLIR infrared cameras are preferred by building experts for fast, reliable, accurate building diagnosis for a wide of problems, from fire and flood investigations to chronic leaks and moisture issues. The GALE FORCE has become the #1 selling Minimum Amperage Air Mover and the first choice of Professional Restoration Contractors when the job demands the best. One Call uses LGR Dehumidifiers exclusively. At One Call Property Services Inc., we stress the importance of using the right tools for the job at hand. That is why our warehouse is stocked with state of the art drying equipment, as well as specialty drying equipment for those tough to dry areas. Specialized equipment is definitely helpful in a water damage situation, as it is crucial that the operator is fully educated in its proper use. That's why our technicians are trained, and whenever possible, certified in the usage of any machine they will be operating. The immediate availability of the restoration tools enables us to serve you efficiently, and our knowledge of the proper tools for the job at hand saves you not only headaches, but money.